March 8th is Pancake Day (a.k.a. Shrove Tuesday)! It’s a great excuse to whip up some pancakes for breakfast (or have ‘breakfast-for-dinner’ if there’s no time in the morning). Adding lemon zest and a bit of fresh juice gives these breakfast treats a hint of lemon flavour that is perfect with strawberry sauce. Fresh strawberries aren’t in season in most areas yet but frozen ones work just as well. Of course, maple syrup also pairs well with the pancakes and is seasonally appropriate. Ricotta is a soft, mild cheese that can be found in the dairy case of most supermarkets. However, it’s also possible to make it at home and doesn’t require any exotic ingredients: Home-Made Ricotta. 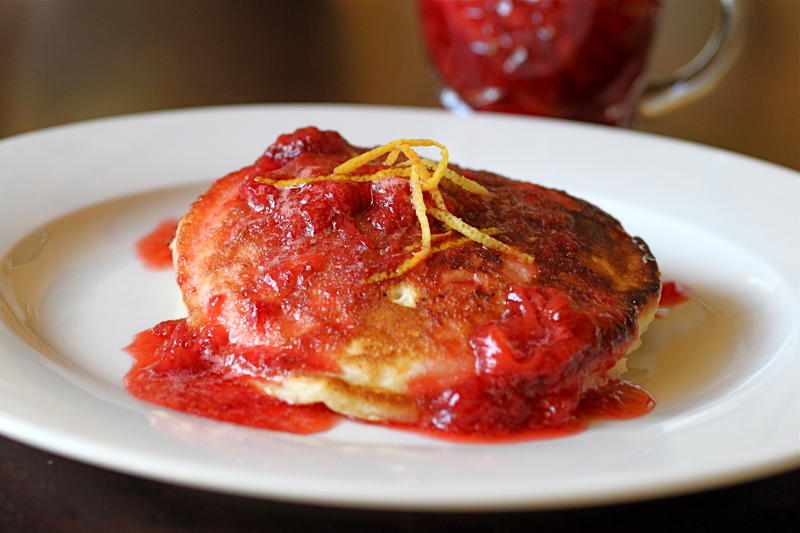 The Strawberry Sauce can simmer while you’re preparing the batter and cooking the pancakes (see recipe below). In a large bowl, add flour, baking powder, sugar, salt and lemon zest. Use a fork to stir until thoroughly combined. Set aside. Pour the milk into a large measuring cup. Break the eggs into the milk and beat with a fork until combined. Melt the butter in the microwave for 1 minute (or in a saucepan if you don’t have a microwave). Let cool slightly and stir it into the milk/egg mixture. Slow pour the milk and egg mixture into the bowl of dry ingredients, stirring as you add the liquid. Add the lemon juice and whisk until the batter is fairly smooth. Break up the ricotta with your fingers and add to the batter. Stir until combined (there may be some small lumps of ricotta but that’s ok). In a large skillet, add a small amount of oil and heat on medium-high until a bit of batter dropped in sizzles. Working in batches, pour three or four circles of batter into the pan. Cook until browned on the bottom, about 3 to 5 minutes. Reduce the heat slightly and flip the pancakes over. Continue to cook until the bottom in browned and they are just cooked through. Move cooked pancakes to a plate and repeat with the remaining batter. Top with Strawberry Sauce (below) or maple syrup and garnish with lemon zest, powdered sugar or fresh strawberry slices if desired. For an extra decadent treat, add a dollop of lightly sweetened whipped cream to each serving. Add all ingredients to a large sauce pan. Heat on medium-high, stirring occasionally. Lower the heat to medium and let the strawberries simmer while the pancakes are cooking (about 15 minutes). Use a potato masher or fork to crush the cooked strawberries. Serve over pancakes or waffles.